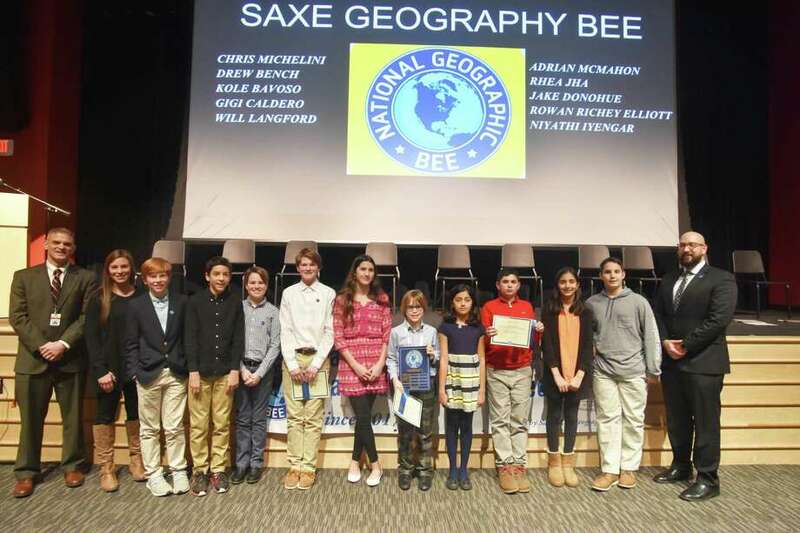 NEW CANAAN — After a tight competition, Rowan Richey Elliott beat out nine other middle schoolers to become the newest Saxe Geography Bee champion. The event, which took place on Jan. 10 at Saxe Middle School, is part of the larger National Geographic Bee. With his victory, Richey Elliott must now take a state qualifying test. If he passes, he will represent his district in Hartford for the state competition. From there, students from fourth to eighth grade across the United States will compete for a chance to win a $50,000 college scholarship at the national championship May 19-22 in Washington D.C. The fifth grader said he was excited to win the Saxe bee, despite his initial doubts. When he first found out he would be participating in the Geography Bee, Richey Elliott said he immediately started studying. To prepare, he used various methods to learn possible subjects that could be brought up in competition. Andrew Faugno-Fusci, an eighth grade U.S. history teacher at Saxe, said students participated in a preliminary written exam before winter break. The top 10 scorers faced off at the third annual Saxe Geography Bee. “Christina Fulco and I run a geography club after school one day a week,” Faugno-Fusci said. As part of the club, students learn how to read maps, typography, states, capital cities and other subjects that will be on the test. Additoinally, students participating in the club take practice questions, quizzes and a mock final. Fulco and Faugno-Fusci were an integral part of starting the Saxe Geography Bee, as well as starting the geograby club. Fulco, a sixth-grade social studies teacher, said there is also a variety of resources online to help students. However, she said, one assett could help above others. “I think just having a passion for geography is a great study tool,” Fulco said. Faugno-Fusci said geography is integrated into the curriculum for Saxe students. In fifth and sixth grades, students learn how to read maps, and in sixth grade students also learn how typography and geography plays a role in culture and history. Modern politics is taught in seventh and eighth grade, as well as how U.S. geography plays a role in some events in history. “They get enrichment in the club after school, but a lot of their exposure comes from the regular classroom,” Faugno-Fusci said.